Going solar is a huge investment for your home, the way I look at it is like buying a stock market that will never lose value. 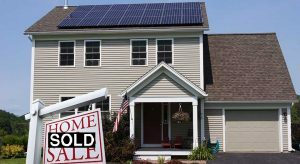 Go Solar & Increase Home Value. Why would you do such an investment? A PV system might be expensive; however, we make it so simple that you will feel that you will not spend a dime on it. Still, remember that this is the best home improvement investment you will ever do. Imagine having your own electricity company. Imagine that you will generate your own power and you will be almost 100% off the grid and in a point pay less than 85% (or more, in most cases) for your electricity. As an example; if you pay an average of $200 per month of electricity, with your PV system you will be paying about $25 per month. With that said, Go Solar & Increase Home Value by 3 – 4 %. You may not want to sell your home, however, we all want to increase the value of the things that we invest in. For some of us, a house is the biggest investment in our entire life. Some of us got tired of paying rent, alternatively, instead of making someone richer, we get off of that by buying for our own place to live. Right after, we are in the search for ways to make that investment have a greater value. Flooring, bathroom updates, kitchen appliances, etc. However, very few of us think about one of the most expensive bills we will pay. While renting or living in our own home, the electricity bill will be one of the most expensive ones. What we want to do is for you to “offset” that bill if you Go Solar & Increase Home Value. The same amount of money you use to pay your electricity bill (which you will never see again) you will invest it in your PV system. Let us help you to understand all this. Follow us for more energy saving ideas in our Power Blog. Send us your comments, we know we can help.